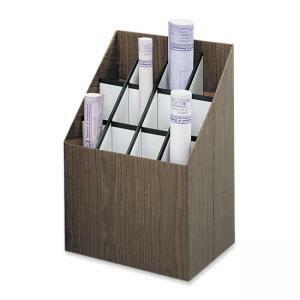 Store and organize your documents with this compact deskside file. Upright Roll File offers a corrugated fiberboard construction for durability and a walnut woodgrain finish for a professional look. Plastic molding reinforces the square tube openings to prevent tears and snags. Roll file features 12 square tube openings that are reinforced with plastic molding. Each slot measures 3-3/4" x 3-3/4". Roll file is made of 100 percent post-consumer material.